Broadcom has launched Max WiFi, the first family of connectivity solutions using the next Wi-Fi standard, 802.11ax. Max WiFi is the newest evolution of Wi-Fi. It delivers blazing fast speeds and greater capacity for the Wi-Fi networks allowing them to connect more devices in more places. The Max WiFi chips from Broadcom enable up to four times faster download speeds, six times faster upload speeds, four times better coverage, and seven times better battery life than similar Wi-Fi solutions on the market today that use 802.11ac. The chips released are designed to kick-start an ecosystem of Wi-Fi routers, residential gateways, enterprise access points, and client devices that deliver next generation Wi-Fi technology. Max WiFi (802.11 ax) is the sixth generation of Wi-Fi and the most powerful standard yet, with innovations that go beyond speed. It supports delivery of simultaneous video, voice, data and IOT services to an ever-increasing number of wireless devices. This means that steady, high-speed Wi-Fi with unprecedented quality of service is available wherever consumers want it: homes, offices and high-traffic public venues such as stadiums. Max WiFi’s unique architecture is also optimized for internet upload, making social media live-streaming and cloud storage seamless. The demand for high performance Wi-Fi in the home is growing unabated with a typical family of four expected to have an average of 50 connected devices by 2022. At the same time, the amount of media content exchanged among mobile devices through the cloud has increased exponentially. According to Extreme Networks, an astounding 11.8 Terabytes of data was generated at this year’s Super Bowl by fans posting videos, updating status, and streaming live from the stadium. The need to support the ‘things’ that connect the home and the mobile devices that create and consume video content in the moment already strain existing Wi-Fi networks. This will be more pronounced for emerging applications such as augmented reality & virtual reality. Broadcom’s Max WiFi, with its innovative architecture, addresses these growing needs of modern consumers in their connected homes. 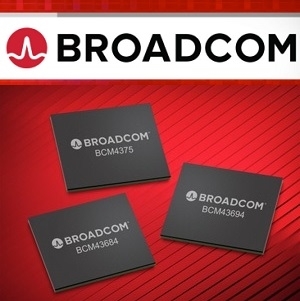 Broadcom’s ecosystem of Max WiFi products includes BCM43684, BCM43694 & BCM4375. Uplink and Downlink Orthogonal Frequency Division Multiple Access (OFDMA) technology, which is the fundamental building block of 802.11ax. OFDMA significantly increases efficiency and capacity of the wireless network as several devices. communicate concurrently in portions of the frequency spectrum allocated proportional to their needs. In addition, it enables fine grain quality of service for complex quadruple play applications via the implementation of sophisticated downlink and uplink scheduling. Multi-User MIMO (MU-MIMO) technology to increase channel capacity when servicing multiple simultaneous devices. Target Wake Time (TWT) to orchestrate specific times when clients wake and sleep enabling mobile devices to reduce power consumption and increase battery life. Spatial Reuse, which allows access points to more efficiently share channel capacity by making intelligent decisions on when to transmit data. Broadcom is sampling Max WiFi solutions to its early access partners in retail, enterprise and smartphone, service provider, and carrier segments. 802.11ax has generated broad support across the consumer-electronics industry. Companies and partners across the ecosystem appreciate the importance of 802.11ax and are committed to its development, integration, and distribution. To learn more about Max WiFi, click here.